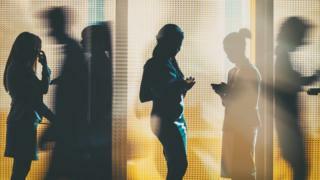 Accountancy giant PwC has banned all-male shortlists for jobs in the UK in an attempt to increase the number of women in senior roles at the firm. It said the move was prompted by its recent pay gap report showing men on average earned 43.8% more than women. The company said recruitment was one of the areas it was looking at as a way to narrow the gap. PwC also plans to ban all-male interview panels and examine how "career defining roles" are awarded. Making sure that "everybody in the firm" had access to important career opportunities such as working on big projects or for well known clients, would be "a real game changer", said PwC's chief people officer Laura Hinton. She said the move was part of the firm's wider plan to improve the diversity of its workforce, which includes looking at the attitude of senior management. It also has a returnship programme, which encourages those who have taken a break from work, such as maternity leave, to do six months paid work experience. The company has also started to allocate "progression coaches" - usually partners - who will work with women and ethnic minorities employees to help develop their careers. The Daily Mail, which first reported PwC's decision, said it was the first of the big four accountancy firms to ban all-male shortlists. Jill Miller, policy adviser at the Chartered Institute for Personnel and Development (CIPD), said it did not have data on the number of firms which had banned all-male shortlists for jobs, but said it was becoming "more common". She said new rules forcing firms to publish their gender pay gaps had increased transparency and focused leaders' attention on how to improve the figures. However, many firms were failing to exploit the data they had on their workforce, she said, such as when and why women were leaving the firm. "It's important to look at as wide a talent pool as possible. Overall it's about levelling the playing field and getting best person for the job." Image caption The Business Committee's Rachel Reeves called the Bank's decision "truly staggering"
PwC's decision comes amid a furore over diversity at the Bank of England, which recently appointed a male economist to its rate-setting Monetary Policy Committee despite a shortlist of four women and one man. The Treasury said the role had been awarded on merit. Ms Hinton said that hiring diverse people at a senior level was "a real challenge" because candidates tended to be "disproportionately male". Improving diversity at graduate and school-leaver levels was easier because the firm had more control, she said. For example, it had found that male graduates tended to apply for graduate placements earlier on in their university career. As a result, rather than filling up their assessment centres on a first-come first-served basis, it makes sure each centre has a 50/50 split between male and female applicants. "Little things like that can stack up against women," she said. "The challenge is making sure that at every stage in the process we are saying yes to get the right person and not excluding. The objective is to keep pushing and to encourage others to do the same."